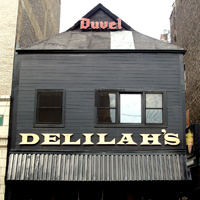 DELILAH'S has an unmistakable rocker atmosphere that takes us straight back to the 70s and 80s punk heyday. It's a great place to get some delicious food and drinks and to shoot pool with your buddies. The beer and whiskey selections are top notch. The selections in terms of music are equally good, with the playlist spanning the genres of rock, punk, ska, mod, metal, and more. Sometimes it's live and sometime's it's the jukebox. Either way it's always good stuff. The drinks are good and strong, and the bartender will know many of your more obscure requests, which is a huge perk if you ask us. One of our favorite places to spend a Saturday night!